Chris Anderson, editor-in-chief of Wired Magazine published The Long Tail article in October 2004 to describe an statistic feature of some statistical distributions that affect to current and future business models. Since then, traditional marketing field has became totally desperate in order to adapt their marketing structures and thinking to this model that “promises new millions of consumers”. 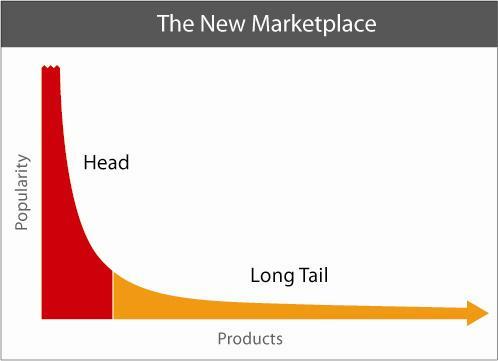 The main idea of the “Long Tail” concept breaks the traditional 80-20 rule, also known as Pareto’s principle in which for example, music industry was based in the last years. This rule suggest that markets will create a certain degree of inequality by favoring the upper 20% of the items (the famous “hits” we had became saturated of) against the other 80% (which are the long tail). Now, in a digital environment, all those 80% items that had not demand in the past could be valuable again through the New Media Marketing. It suggest that traditional advertising is losing its influence on consumers because a growing trend of them make purchasing decisions off Internet research and referrals. Social networks are the tool for extending the reach of marketing to the low-frequency, low-intensity consumer in a cost effective way. A large number of microentrepreneurs around the world, particularly music industry entrepreneurs, use social networks like Facebook to communicate with their suppliers, clients or to gain visibility for and sell products and services. In response to this growing demand, Facebook for example, has launched a service to help small entrepreneurs promote their businesses through social networks. So, we can argue that while we are chatting with our friends or sharing some photos of the last weekend in Facebook, there are a lot of anxious product strategists looking for videos and information like this in order to attract our attention to their products. One of this product strategist, Adam Richardson, argues that: ” A large shift is going on in our connected society: we are leaving the Information Age and entering the Recommendation Age. Today information is ridiculously easy to get; you practically trip over it on the street. Information gathering is no longer the issue -making smart decisions based on the information is now the trick… So recommendations act as shortcuts through the information mass, getting us to the right, or “right enough” answer. The Long Tail concept is based on Amazon.com recommendations. On line bookseller software, notted patterns in buying behavior and suggested that readers who liked “X” also would like “Y”. As Chris Anderson claim in his article:”Forget squeezing millions from a few megahits at the top of the charts. The future of enter entertainment is in the millions of the niche markets at the shallow end of the bitstream”. Therefore, there is a change in how digital cultural marketing is acting in the Social Network Environment. After all, it seems a good advantage for changing the traditional range of cultural products that people were used to receive from the traditional model. But, are we working (being part of the Social Network) for “them” (entrepreneurs with private interests)? and It is the recommendation system a good option to spread the sub-culture that has been hidden for so long? « Are you a nerd, a geek, a dork or a dweeb?